The UK Government will no longer support search and rescue operations to prevent migrants and refugees drowning in the Mediterranean. Here is a first hand account of what it is like to be shipwrecked and stranded at sea. It’s old – from January 1916, and it’s long. But it explains what it’s like to walk down the side of a sinking ship into the sea, to swim for half an hour, to be in a lifeboat for two nights, to be ignored by two ships and eventually rescued. We are condemning people in this stuation to die because of their lack of paperwork. I will try and give you some account of the sinking of the poor old “Persia” while it is still fresh in my memory, though I don’t think I’m likely to forget it in a hurry, much as I should like to. It was just after one o’clock on Thursday, Dec 30th, and the gong had just sounded for lunch; consequently the majority of passengers were assembled in the saloon and a good many had actually begun lunch. (As this is a personal account, you must excuse the continual occurrence of the personal pronoun “I”, but I’m afraid it is unavoidable). I was a trifle late and strolled in about 5 past, and was just sitting down in my place when there was a muffled “bang”, though it sounded loud and clear enough and one felt the concussion quite distinctly. Everyone of course knew at once what had happened; we all rose from our seats and begun to file out of the saloon. There was no panic, no rush, it was, as someone described it later “just like going out of church”. I heard only one remark, someone saying “not much doubt about that” otherwise everyone was quite calm and collected, outwardly at any rate. We all went to our cabins and got our life belts and went on deck, and proceeded at once to our boats. My boat was No 7 on the starboard side, and when I got there the crew were already endeavouring to lower it. This must have been a minute after she was struck, and the “Persia” was already beginning to list to port a bit. Our boats seemed to stick in the davits and refused to be lowered, despite the efforts of the crew and ourselves. The list to port was now becoming very marked, and it soon became quite 45° and one had to hang on the rail to prevent oneself sliding across to the port side, and anyone who was the least bit late in coming on deck had perforce to go to the port side. It was soon obvious that our boat could never be launched in time, as the old “Persia” was now almost on her side. Someone said “time to go now” so in company with several others, I scrambled over the rail and walked down the side of the slings, which was now of course nearly level, she had heeled right over to port. No 7 boat was still fast in the davits, though a little lower down than before and I thought the best thing to do was to hang on to her as she might still get loose. However, just then the “Persia” gave a final lurch, and her keel appeared above water, and a huge rush of water from under her caught me fair and square just as I was hanging on to the life-line of No 7 boat, and I was carried right away from the ship. I then saw it all, the last few seconds of the old barge. She half-righted herself and then sank with appalling rapidity, the last thing I saw being her bows standing right out of the water, about 30 feet of them, and then these slid out of sight silently and suddenly. The sinking slings caused very little suction, but the water all round was of course very much disturbed. The whole tragedy had taken just 5 minutes, from the time the torpedo struck, till the “Persia” disappeared. The scene that followed was too terrible to describe in any detail, even if I could do so. The sea (which had quite a nasty swell on though not exactly rough) was full of human beings and floating wreckage, chairs, tables, broken pairs of were everywhere. The air was full of groans and cries, and everywhere one looked it seemed one saw human beings struggling in the water. It was awful. Our lifebelts kept us afloat easily, but we all hung on to wreckage. Each bit I got on to seemed to be chosen by several other people, so I had to change several times, as there were too many on several places to support the weight. I looked round, a bit dazed of course, and could see four boats some way off, and one upturned one. Obviously the thing to do was to swim for the boats, so, shouting out this to the others I started off. It was difficult work, as the sea was so full of wreckage that one got knocked about a lot and it’s hard work swimming in a lifebelt too. The boats seemed miles off and I seemed to get no nearer. By now the swell and current had scattered everyone over a very large area, and the boats were packing up as many people as they could. While swimming along I heard groaning and crying close to me and saw a lady lying on her back, apparently utterly exhausted and just drifting helplessly away, supported by her lifebelt. She was delirious I should think, and kept saying she was dead and dying, so I took her in tow though there seemed little chance of our reaching the boats, as I seemed to get no nearer. Fortunately she lay quite still and though my legs kept getting mixed up in her skirts, and she was rather a dead weight, I managed to swim on and at last succeeded in hailing a boat. They fortunately saw me and waved back; I had already got near one boat but they handed oars out and I was carried away from it again by the sea. How hopeless it all seemed then. After more struggles I at last reached the boat; after three ineffectual grabs at a rescuing hand, I seized it and we were hauled on board. I was thankful to get in. I must have been in the water half an hour and felt quite done up. I’m afraid anyone who was afloat when she went down and couldn’t swim must have been lost, as the boats soon drifted away from the scene, the swell and current being very strong and I’m afraid, too, many people got injured by the floating wreckage. The boat I was in contained about 40 people. We got oars out but it was hard to make any headway in that sea and with such amateur oarsmen. We looked around for more survivors but could see none, and except for a few pieces of isolated wreckage which were here and there visible, the rest having been scattered, it was hard to realise that a ship had gone down. There were now four boats afloat all full, and one upturned one in the far distance with a few people clinging on. Some people swear to having seen a fifth boat full of people but nothing has been heard of this since. The chief officer of the “Persia” (to whom we owe our lives as he cut away 3 boats from the darts with a hatchet, there being no time to launch them; the fourth had been launched somehow or other) was in one of these and he shouted out orders to all keep together in a line. The chief officer then transferred some from his boat (which was only the small “accident boat” for use in case of man overboard) which was carrying about 10-12 more passengers than it could hold, to ours, and the others. We had now just over 40, including 6 women and 2 children. 1 ship’s officer, 4 male passengers and the rest stewards and native crew of the “Persia”. All our watches had stopped at 1-15 or 1-20, but it must have been 2 o’clock now. We tried to keep our course S.S.E. towards Port Said, so as to fall in with other ships if possible, but it was a difficult job in that sea. About 4 o’clock I suppose we sighted the masts, funnels and smoke of a ship on the horizon, which cheered us all up and her hull soon appeared. (I must tell you here that there had been no time to send off an S.O.S. signal by Marconi, so no one knew what had happened). Suddenly a huge column of water was seen to shoot up by her, followed by 5 shots from a gun. It seemed she too had been torpedoed or shelled by a submarine, and perhaps was firing at the submarine. In any case she got no nearer to us, although she did not sink at once, she gradually faded away in the gathering darkness. We now tried to make ourselves comfortable as possible for the night. We were all wet through of course, and it soon got very cold. The four women were very thinly clad but we gave them coats and sail covers and there happened to be a very thin blanket on board. But it was so bitterly cold for them I’m afraid. However they were just splendid, one poor girl had got a nasty cut on her head from a piece of wreckage and fainted, but we made her as comfy as possible. Of course, the boat was crowded and one couldn’t move about at all. We put out “sea anchors” to keep the boat’s head to the sea, and let ourselves drift. The current taking us in the desired direction, soon after dark the lights of a steamer appeared so we burnt glasses to attract her attention, but she put out all her lights and cleared off; she evidently thought we were a submarine and suspected a trick. (I believe the Admiralty have issued orders accordingly so as ships may not go to any promiscuous lights as the enemy are up to all sorts of dodges). So two ships had gone by and no rescue. It was rather disheartening, but we were not downhearted yet by any means. I had to lie right up in the bows, looking after the painter which was joining our boat to the next one, as it kept parting and coming undone. It was cold, as I was so wet. I shivered all night and most of next day, even in a hottish sea. The night dragged itself through. Sleep was out of the question; we made the women as warm as we could and gave them all the coverings in the boat, but I’m afraid they suffered a lot, but bore it like Britons and never complained once. The two kids rescued were both in our boat; one was a French little girl about 6, in the bow with me. Poor kid, I tried to keep her warm, but she kept asking in a plaintive voice “Where is the big boat which was coming to help us”. It was awfully pathetic, as we could only say that it was soon coming now. Dawn at last came, and we had a dry biscuit and a sip of water each. We had 2 kegs aboard, but the stopper had come off one so only one was filled. The other boats were in an equally bad way for water. Early in the morning we hoisted a sail in our boat and tried to tow the other three along, but it was not much good and we made slow progress. About 9 o’clock, I suppose, we sighted a ship on the horizon, so it was decided that we, having a sail, should go after it alone and try to hail it. We sailed away and carefully watched at the chance of a rescue, and tried to cut her off. She must have been able to see our sail, but she sheared off eventually and disappeared. Another chance gone, and one or two began to lose heart, though I must confess that all the time I felt confident that something would find us, provided the weather held and we were not swamped. It consequently turned out that this ship was actually at the time being chased by a submarine, so of course, could give us no attention. We forgave her then, though at the time it was not blessings we called down upon her head. Heated discussions now took place as to what the best thing to do. Some were in favour of each going our own way and trusting to being picked up and telling the rescuing ship that other boats were still afloat. Others were all for sticking together chiefly because only two boats had sailors in them, the other two only passengers and stewards. All the sailing about on our own and returning to our comrades after one fruitless mission of course took many hours and the sun was now high in the heavens, 12 o’clock. We all tied together again, lowered our sail and had a rest, just allowing ourselves to drift. The chief officer then said that he was going off in his boat to look for help, and the other 3 were to stay together. So off they went with our blessing and fervent hopes for success, while we stayed on. Night began to fall and we rearranged our boat and made the ladies more comfortable than they were the previous night. Watches were told off to look for rescuers and look after the boat, and the rest made snug (?) for the night. You must remember that all the time we were filling up odd moments with bailing out water, rowing, and generally trying to keep afloat, so we were all quite tired enough though of course had lots left in us yet. It was now the second night after the tragedy. I know I was just dozing off, though it was almost impossible to sleep in that crowded boat and of course we were bobbing up and down like a cork the whole time, when someone shouted out ship ahoy. Imagine it, how we all bucked up once more. It was quite dark and we fervently hoped that this ship would not treat us like our friend of the previous night. She seemed to be making straight for us by her lights, but the thing was to attract her attention. We burnt a red flare in each boat (they are of course kept in water-tight tins in each life-boat) and rowed in her direction. Great speculations as to what she was, a sailing ship? a cruiser? a liner? Impossible to tell of course. As we got nearer we all gave three yells (we were ahead, the other two boats following some way behind) and burnt more flares. At last, after about 20 minutes she loomed up out of the darkness. “A destroyer” said some knowall in the boat, and then an unmistakable English voice hailed us from her “Hello you fellows we’ve got the other boat all right, come along the starboard side with you”. And so we were rescued. It was just after 7 o’clock I think, so we had been about 30 hours in boats, not so very long, but quite long enough, so we all thought. Our rescuers proved to be H.M.S. “Mallow” a mine sweeper. She had heard nothing of the “Persia”, but the chief officer’s quest had been successful, and they had seen his flares and picked them up, and he had of course told them whereabouts we were and they came straight to us. They were good to us. A good meal for all, clothes and every possible attention; no one could have been kinder. I could have cried with relief; to see those poor women and children looking more or less happy again, at any rate relieved beyond words at being rescued, was a sight for the Gods. We were soon accommodated in hammocks and got some much needed sleep. They sent wireless messages off at once, and those must have been the first news of the loss of the “Persia”. The “Mallow” was just out on her own, hunting mines and submarines, so we were lucky indeed as she was keeping no particular course, but wandering about anywhere, and just happened to meet the chief’s boat by a mere chance. We made all speed to Alexandria, a wireless having been sent off there for the despatch of another boat to look for any more possible survivors. We reached Alexandria at 3 p.m. next day (Jan 1st) and were taken on board H.M.S. “Hannibal” where again they were more than good to us. We must have presented a sorry spectacle; dirty and bruised in many cases, many with cuts and wounds caused by wreckage, looking a trifle worn and haggard I expect, but none the less happy at our rescue. We went ashore and made the more immediate purchases necessary for our comfort and stayed that night aboard the Hannibal, and came ashore next day and put up at the Savoy hotel, where we have been ever since. We are more or less clothed and in our right minds now and everyone has been more than good, but I fear the mental and physical results of all we have been through are beginning to make themselves felt now, though I think everyone is remarkably fit under the circumstances. I will continue with a few disjointed remarks on circumstances connected with this awful business. No one saw the submarine, though the officer on watch on the bridge saw the track of the torpedo for about the last few yards, but she had struck before he could give any orders. She struck almost amidships, just under the funnels, bursting a boiler and killing I’m afraid all the engine room staff who were on duty at the time. Only one boat was lowered in the orthodox way. The chief cut away 3, and the 2nd officer 2 more. These latter two, however, full of passengers and crew were caught by the davits as the ship heeled over and were swamped. I’m afraid nearly all the first class passengers (there were only 14 I think saved out of 80, and only one lady first class passenger) were caught up on the port side when she heeled over and were carried down with her. The behaviour of the ladies was just priceless, they bore their sufferings wonderfully and did all they could to help. There was no panic on board, but the whole thing was over in 5 minutes and gave little time for thought. Some people had marvellous escapes. Two second class passengers, sisters (one married with a little boy) when she was struck went to opposite sides of the ship, all three went down with the ship and came up again side by side in the water, though they were on opposite side of the ship when she sank; they were all three rescued. As the ship heeled over a huge blast of ashes etc came out of the funnels just as they were level with the water, and several of the rescued were coal black, including the chief officer, who also got a nasty knock on the head from one of the funnels. 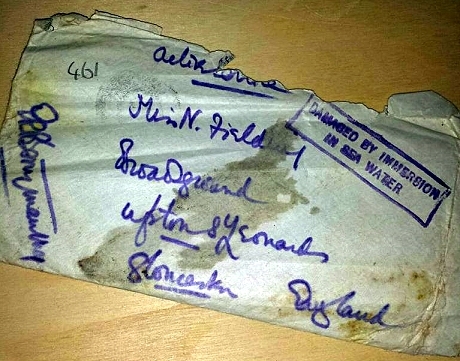 All the Christmas mails for India, China, Aden, B.E. Africa and Egypt went down, terrible isn’t it. No one saved a thing except what they stood up in. The sensation of walking solemnly over the side of the ship into the water is indescribable. For myself (and the others tell me the same) I felt no fear, more annoyance than anything else; but I know I shall funk it now. Everybody’s nerves seem to have gone a bit. It seemed so deliberate but was the only thing to do of course. I’m afraid a great many people didn’t leave the ship, or jumped too late and so were drowned. The engine kept going to the last and when she was lying on her side the propeller was racing round, half out of water and causing a tremendous stir, splashing up the water to a tremendous height. The chief engineer on hearing the explosion went down to the engine room to turn off the steam and was last seen down there disappearing into a cloud of steam. A very plucky thing to do, but it was hopeless and he was never seen again. The captain was not rescued. I saw him on deck just before she sank, tying a life-belt on to a lady. He had not got one on himself. He must have gone down with the ship. Fortunately she was an empty boat as regards passengers. Only about 80 first class and not many 2nd. The horrible part is the number of women missing, and children too; but I think that all that was possible to rescue were rescued. I hope I never go through such a terrible experience again. A pal of mine, one Fisher of the Indian Army, summed it up by saying “It was worse than any attack”, and I think he is right. I have tried to give you a comprehensive account of this awful business. Please forgive the many literary shortcomings, but it’s a hard thing to write about, but I know you would like to know all about it, as I don’t suppose you’ll get much from the papers.